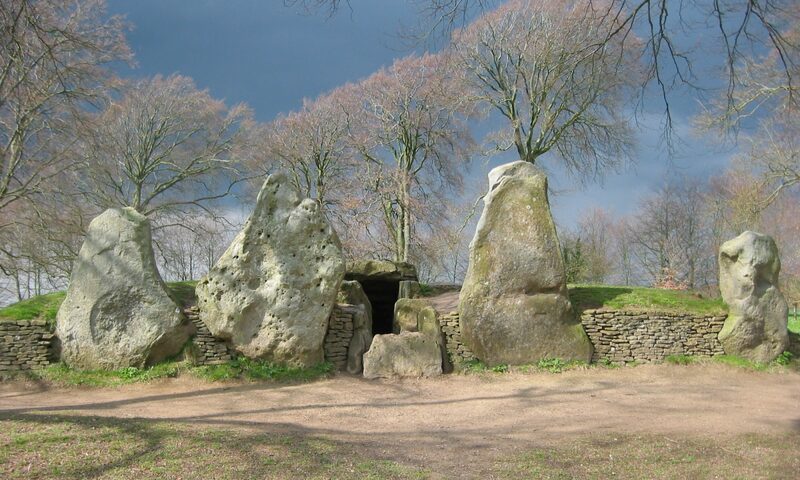 Wiltshire, in southern England, is well known as the location of many ancient, Neolithic sites. Stonehenge is found here, as is Avebury, a large circle and alignment of stones, and countless Neolithic hill forts and burial mounds. More modern sites (eighteenth century) include the large white horses carved into hillsides and visible from the motorways. Wiltshire is also one of the best places to find the most recent earth-based, large scale phenomena: crop circles. On a recent trip to England, my husband, Harry, and two children, Harrison and Jocelyn, stayed in the heart of Wiltshire in order to explore the ancient sites. We spent a morning at Avebury, an afternoon at Silbury Hill and an evening in the inner ring of Stonehenge. To finish our tour, we decided to climb a hill just south of Avebury to get a closer look at one of the white horses. Jocelyn and Harry were the first to climb high enough to see the crop circle laid out in the field below the horse, but it was Harrison and I who decided to actually go into it. Harrison picks up the story from here: The circle looked like a giant Star of David, with petal-like formations on the outer edge, and a circle in the centre. It measured about 30 meters across. In the distance, we could make out another circle that appeared to have the same design as the one below us, and Harry said he could make out a third circle in the distance. Close to the first circle, was another, smaller crop design about 5 meters in diameter. It looked like a child’s drawing of a sun with rays. We couldn’t see a path leading to the smaller circle, but there was a narrow path in, and a similar path leading out, of the large circle. It appeared that one or two people had visited the circle before us. I felt the energy in the circle with my hands. It was very still… Outside the circle, a meter away, it was easy to feel the life energy radiating from the wheat. It was not the absence of life that bothered me in the circle but the absence of anything… Susan finishes the tale: I measured the energy of the circle with my pendulum. Throughout our visit to Wiltshire and the ancient sites, the pendulum had been very active, swinging clockwise and counter clockwise and giving me very high energy readings. It was dead still when I held it inside the circle, but returned to normal when I turned slightly and held it over the undisturbed crop. As well, there seemed to be a distinct difference in air pressure in the circle, and we joked that it was like being in the “Cone of Silence” from the old Get Smart TV show. By the time we’d finished with the circle the sun had set, and as we hiked across the field towards the car in the growing darkness, I couldn’t help scanning the sky for signs of … who knows what. In the end, we chose not to attempt any further adventure that night, but we are left, still, with the questions: Who? How? Why? Published in: “The Quester”, Vol. 23 No. 3/Journal #66, Fall Equinox 2003; and on the Canadian Society of Dowsers website www.canadiandowsers.org and www.dowser.ca September, 2003.